Gromov’s Surface Subgroup Question: Does every one-ended hyperbolic group contain a subgroup which is isomorphic to the fundamental group of a closed surface of genus at least 2? First let’s start with the precise definition of a random group. There are actually two parameters in the definition — the density and the length . A random group at density and length is obtained by fixing a finite generating set with at least 2 elements, and adding “random” reduced words of length as relators, where the number of relators to add is governed by the density . Precisely, is the multiplicative density of the relators. There are (approximately) cyclically reduced words of length , so we choose subwords, independently and with the uniform measure, as our relators , and then define to be our “random group”. 3. At the group satisfies the small cancellation condition . Theorem (Calegari-Walker): A random group at density contains many quasiconvex surface subgroups, with probability . In particular, they contain surface subgroups with overwhelming probability. In fact, at the MSRI conference I gave a partial announcement of this theorem, saying only that we could prove the existence of surface subgroups at “some positive density”; I was worried about the fact that at density the group is no longer and therefore not a small cancellation group in the classical sense. However, it turns out that Yann Ollivier developed enough elements of a kind of small cancellation theory for random groups at any that the argument can be pushed all the way. The proof contains some technical details, but I believe that some of the main ideas of the proof can be given in a blog post. But before I do so, I think it is worth discussing (very) briefly why one might be interested in finding surface subgroups. I do not remember exactly my motivations and heuristic evidence in favor of the existence of “many surface groups in many hyperbolic groups” except for connectedness arguments at the boundaries, but I had (and am having) a feeling that these are essential structural components of hyperbolic groups. My own view, and my main interest in this question, is stimulated by a belief that surface groups (not necessarily closed, and possibly with boundary) can act as a sort of “bridge” between hyperbolic geometry and symplectic geometry (through their connection to causal structures, quasimorphisms, stable commutator length, etc). Surface groups are the “simplest” kind of hyperbolic groups after free groups, and surfaces themselves are the “simplest” class of symplectic manifold; any route between the two kinds of geometry must surely say a lot about surfaces. In this vein, I should remark that in the world of 3-manifold topology (where these issues are infinitely better understood), surfaces again play the premier role in both worlds: minimal/pleated/shrinkwrapped surfaces in the hyperbolic world, norm minimizing/pseudoholomorphic/convex in the contact/symplectic world. It is worth remarking that for the longest time embedded surfaces played a preeminent role in both theories, but that recent breakthroughs (on the hyperbolic side) have depended on developing a deep understanding of immersed surfaces. I wonder whether there is an important role for immersed surfaces on the symplectic side (in -manifold topology)? Maybe a reader who is an expert on Heegaard Floer homology can offer an opinion. OK, let’s move on to the proof of the Random Group Surface Subgroup Theorem. The first step of the proof builds on a construction in our paper Surface subgroups from Linear Programming, where we show that a sufficiently random homologically trivial collection of cyclic words in a free groups can be taken to bound a certain kind of combinatorial object called a Folded Fatgraph (this result also underpins the main theorem in my recent related paper Random graphs of free groups contain surface subgroups, joint with Henry Wilton). A fatgraph is just an ordinary graph together with a choice of cyclic ordering on the edges incident to each vertex. Such a graph can be canonically fattened to a compact surface (with boundary) in which it lies as a spine. Stallings famously observed that an immersion (i.e. a locally injective simplicial map) between graphs is injective on fundamental groups; such a map of graphs is said to be folded. Thus a folded fatgraph gives an injective surface (with boundary!) subgroup of a free group with prescribed boundary. Thin Fatgraph Theorem: If is a sufficiently random homologically trivial collection of cyclically reduced words in a free group , then for any there is some depending only on so that copies of bounds a trivalent fatgraph in which every edge has length at least . 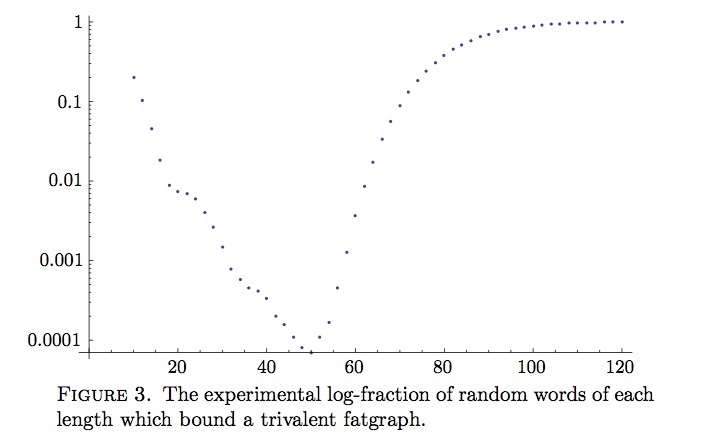 The first time we did this experiment, we only looked at words up to length 50 or so; needless to say, this gives a somewhat misleading idea of the asymptotic picture! How can one use thin fatgraphs to build surface subgroups? Before tackling a random group, let’s consider a one-relator group with a single (long, random) relator . We can imagine building a (polygonal) surface out of disks, each of which has either or on its boundary, where the disks are glued to each other along mutually inverse subwords of the boundary words. Since a random word will probably not be homologically trivial, we build a surface out of disks labeled and disks labeled , where is as in the Thin Fatgraph Theorem. The 1-skeleton of is a graph, and the way in which it sits in gives it a fatgraph structure. The first thing one might think therefore is that one should just apply the Thin Fatgraph Theorem to build a fatgraph bounding . One can do this, but why should one expect the resulting surface to be injective? In order for the surface to fail to be injective there must be some essential loop in the 1-skeleton which bounds a van Kampen disk in the group. Without loss of generality, we can assume that this disk has a minimal number of faces; note that each face has either or on its boundary. A (random) 1-relator group is hyperbolic; in fact, it is for any with overwhelming probability, when the length of the relator gets long. So in such a van Kampen diagram there must be very long subwords (of length ) in or which are subwords of . Of course, does contain long subwords of and ; the boundary of the fattening of consists entirely of such words! But in a minimal van Kampen diagram such “boundary” subwords must not occur, and the question is whether contains long subwords in common with or that are not boundary-parallel. A counting estimate gives the following heuristic answer. By the defining property of a Thin Fatgraph, for any there are paths in of length starting at any point, and only starting points. On the other hand, there are random reduced words of length , and the relator contains at most of them. The difficulty in making this argument rigorous is that the fatgraph is not independent of ; in fact it is constructed “from” in a direct sense! So the trick is to break up into small subwords, and build thin fatgraphs bounding each subword, and then each small thin fatgraph will be independent of the other subwords. Explicitly, we find what we call a Bead Decomposition of ; this is a decomposition of into subwords of length which start and end with mutually inverse subwords of length . The inverse subwords at the start of each are paired, to produce a collection of beads of size , separated by intervals of length called necks. Each bead on its own will probably be homologically essential, but we can perform a bead decomposition at “the same” locations in the word to get a collection of pairs of inverse beads of length . Taking copies of each pair of beads, we can build a thin fatgraph that bounds it, and then these thin fatgraphs are joined one to the next along necks. By construction, the subwords contained in the spine of the fatgraph bounding a bead are independent of the subwords in for , so with overwhelming probability, they have no long subwords in common. The necks are sufficiently long that whenever a subword passes over a neck, another copy of that subword cannot appear within distance for some (with high probability). But the existence of a van Kampen diagram would give rise to a long string of such coincidences, and therefore we deduce that no van Kampen diagram exists, and the surface is injective. We now throw in an additional random relators of length independently, and with the uniform measure. Now the naive counting argument above is rigorous, and each additional relator is unlikely to have a long segment in common with a subpath in the spine . In fact, what can be shown is that for each there are of order relators that have of their boundary in common with a subpath of (this common part does not need to be consecutive, but we do need to bound the number of connected components by some constant independent of ; this is where Ollivier’s small cancellation work comes in to bootstrap such “local” small cancellation estimates to “global” ones). From this argument, and some elementary reasoning with van Kampen diagrams, the result follows. One subtlety is that it is necessary to control the size of the van Kampen diagrams we consider independently of . A path in a hyperbolic group which is not quasigeodesic can be shortened on a segment of size , where is the constant of hyperbolicity. Ollivier shows that is linear in , for fixed , and therefore we can obtain estimates on the probability that fails to be injective by considering van Kampen diagrams containing a bounded number of disks. This entry was posted in Ergodic Theory, Groups, Surfaces and tagged ergodic theory, Gromov's surface subgroup question, hyperbolic groups, Random groups, surface subgroups. Bookmark the permalink. Is there anything that can be said about the index of these surface subgroups? Yes: they’re certainly of infinite index.